Buying Paeonia Ivory Victory will get you a real winner of a peony! This variety starts with large, light green flower buds of about 45 mm and will change its colour to a bright white when fully bloomed. Peony Ivory Victory is a double-flowered variety with sphere-shaped flowers. The outer petals are very coarse, but turn more delicate to the centre. This peony variety is a seedling of Bowl of Cream and was registered in 1988 by Roy Klehm. For a peony that is just thirty years old, it has already gained quite a bit of fame. The variety is harvested very late in peony season, even later than Sarah Bernhardt, which is a huge advantage. Because of this, Ivory Victory doesn’t suffer from competition with, for example, Bowl of Cream and Bridal Shower. 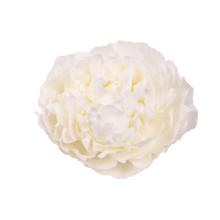 Ivory Victory is a peony that opens easily and has strong stems. Cut the stems diagonally and put it in some lukewarm water. Start enjoying!